Photograph of the Bajinath Temple in Kangra from the Brandreth Collection: 'Views in Simla, Cashmere and the Punjaub' taken by an unknown photographer in 1865. Caption "The BaijnathTemple, in the district of Kangra is dedicated to Shiva, and is celebrated for a very ancient Sanscrit inscription, not yet translated satisfactorily, and for its temples of monkeys." Th sanskrit inscriptions in sharada script on the stone slabs found in the temple explain the village of Baijnath in earlier times was known as "Kirgram" the famous capital of Kiratas. 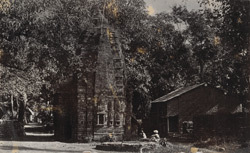 This temple was built by two wealthy brothers of Kiragram. The temple has a shiv Linga enshrined in the grabhagrihas surmounted by a spire in the shikhara style.